At his Mission Chinese redux, Danny Bowien has traded in beer kegs, paper dragons and a cramped, dive-punk Orchard Street basement for smart cocktails, banquet-hall booths and an ample, gleaming dining room in the far reaches of Chinatown. That inescapable hour-long wait for a table can be spent in the downstairs bar, but the real party is upstairs—a lively hodgepodge of bespectacled food disciples and beanie-clad millennials spinning lazy Susans loaded with pork cheeks and turnip cakes while golden-age hip-hop pumps through the room. It’s a rollicking good time, sure, but a wildly inconsistent one. 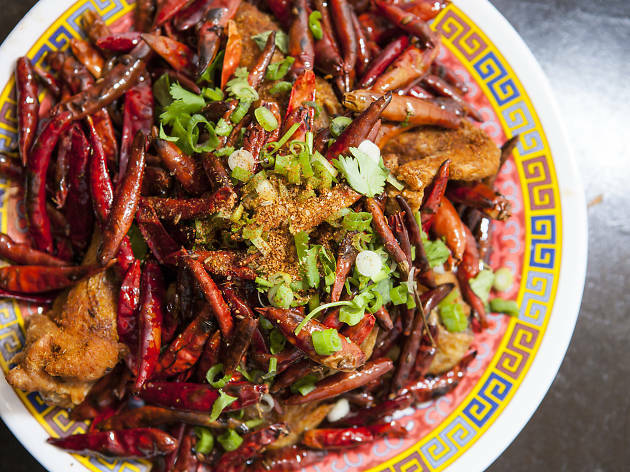 The Scoville-crushing chicken wings have retained their unmerciful, skin-rippling heat, but other Bowien-fan favorites have had their burners turned down: The kung pao pastrami is a flickering flame compared to the four-alarm-chili roar it once was. The menu expands from those oldies with 30-plus new dishes, many of which show Bowien—with executive chef Angela Dimayuga—hasn’t wholly lost his edge. A tin of anchovies, served with tartine flatbread blistered by a wood oven inherited from former tenant Rosette, packs a power punch of pickled chili and crunchy fennel seed. It’s salty, spicy and impossible to stop picking at. The whole-smoked pork jowl is over-the-top lardy—one bite satisfies your fat quota for the day. Better are the Jurassic salt-and-pepper lamb rib tips, soft and lax on the bone. Slick a piece of flatbread with kefir crème fraîche, then pile on a few shreds of lamb and a zippy bread-and-butter pickle—it’s Mission-gone-Moroccan, and staunchly, singularly Bowien. Point of view has never been the chef’s problem—he’s got personality in spades. But that freewheeling, dip-a-toe gumption often translates to a lack of focus. There’s simply too much going on here: a sea-urchin-stocked raw bar, a roaming prime-rib cart and, most egregiously, pizza—a soggy, passable pie added to the menu simply because of that wood oven’s existence. The old idiom applies: Just because you can doesn’t mean you should. Love this place. Either San Francisco or Manhattan. You're the best Danny. I liked Mission Chinese, but I didn't love it, as sad as that is to say (like Sally mentioned below me). It had a lot of hype, but I would say the dishes were just a few notches above other good Chinese restaurants, but for more money. I would pass on the Green Tea noodles and the salt cod fried rice, as there wasn't much cod in mine, and go for the Kung Pao Patrami, which was excellent and the only redeeming dish. I did go for Chinese New Years last year though and had a great time. They do throw some good events and it's a cool space. I really, REALLY wanted to love Mission Chinese. Sadly, our love affair wasn't meant to be. This was my first visit to the restaurant, and sadly, no one warned us about the numbing sensation that happens with the spicy oil. Not that big of a deal as it wasn't too bad, but I wish the menu stated which items had it in there so I could have better planned out what food to order. The first dish with the numbing oil wasn't bad, but by the second, I didn't really have any tastebuds left. I started brunch off with the spicy peanut noodles (with numbing oil). The noodles were cooked perfectly, but the dish had a significant amount of garlic in it that overtook the flavors of everything else. From there we went to the thrice cooked bacon which had so much of the numbing oil in it that I really couldn't taste anything . I tried to offset that problem with the beef dumplings (that come in a soup/broth - a fact not indicated on the menu), but unfortunately, it wasn't enough to remedy the problem. By the time the eggroll came out, my tastebuds were exhausted and unhappy. Outside of the food, the service was spectacular and friendly. I also liked the eclectic vibe of the decor inside. Overall, I think there are plenty of good options on the menu that are worth trying, but unfortunately, I picked the wrong combo for my experience and didn't enjoy my brunch. 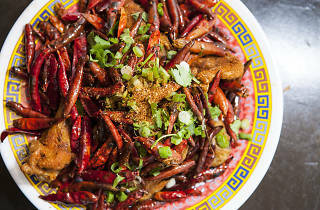 When Mission Chinese Food was on Orchard, I was aiming to be its most frequent customer– it was a simple Sichuan adventure by filled with cheap, spicy, mouth tingling staples. Now lets talk about this mess of a eatery. Besides moving, the menu has evolved into a cornucopia of science experiments that warrant an intervention. Very few iconic dishes made it to the new location but its not a compelling reason to go back if you've dined there before. Overall, I will not be going back here again, now if you're talking about his San Francisco location– let me buy my plane tickets. If you’re into Szechuan food this is for you. Unfortunately this was a bit much for me. Not because of the actual flavors – the food looked delicious. But because of those peppercorn things that are used to add heat, but end up making your entire face go numb. Normally I pick them out (as whole balls) but this restaurant seemed to grind them up, so there was no avoiding them, and frustratingly I couldn’t taste any of my food because my face was so numb! I also turned up on time for my table booking that I paid $5 through the reserve app (that’s the only way to book) and still had a 30 minute wait!